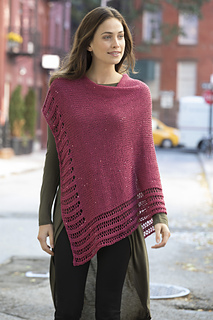 The City Lights Poncho is the perfect coverup for the beach or chilly summer nights. The garment is made in one piece and the edging is simple enough to be a beginning lace project. An asymmetrical shape makes this poncho easy to wear with a shoulder bag. This Poncho was made with a DK weight and a thinner yarn held together. If you would like to use a single strand of yarn I recommend using a worsted weight cotton and linen blend.